Home Inspectors are seen as nitpicking, so the frugal homeowner has to find ways to do the job right. Here are some tips to that end. Home inspectors on the web seem to consistently write two types of posts: why do you need a home inspection; and look what was done wrong by this homeowner. Of the latter type, there consistently seems to be the attitude of looking down at the home handy man and his efforts to repair his own house. Ask any home inspector about their own house, and they will have to admit that another inspector would find the same problems. It comes across as a double standard. Last week at a home inspection in the 77084 zip code, I found a house that looked beautiful, but there were many small mistakes. Either a newly minted general contractor had done all of these repairs, or it was a homeowner who knew the basics of home maintenance. I mentioned the zip code for a reason. If you know this area, then you would know that many homes here are smaller, and the residents range from working class to middle class. Every time that I am in this neighborhood, I see many do it yourself repairs. With the current economy, this trend makes sense. I grew up in a family that did many repairs or maintenance on our own, so I always have thought of doing things myself. The problem is that most of us like to take shortcuts. We use parts and tools that we have at hand. When we go to buy parts, we make do with what we find, but often this is not the proper piece. Is hiring a service company that much better? Not always. I singled out “newly minted” professionals in the previous paragraph; however, in the last three months, I have run into a plumber who used the wrong parts on a job. He defended himself at first with the statement that the parts are correct, just mislabelled. Afterwards he stated that since the building inspector had approved his work that he does not need to correct his mistakes. An HVAC technician informed that he had the ability to carbon date soot marks to the month through a visual inspection. How does someone develop such super human powers? With another technician, I was trying to explain a problem that I noted on a unit. He had just completed the job, and he did not want anyone questioning his work. He did not actually listen to my question, and he answered by referring to another part. It turned out that a month later, another technician had to perform the same job. This man was surprised when we mentioned that this job was performed last month. He showed us the evidence that it had not been done. The problem with these service men is that they were at established companies with a long period of personal experience. If they cannot do the job correctly, there is no point in using them. A contractor should always listen to you, and they should be able to reasonably explain their work. I had fun repairing a leak under my kitchen sink yesterday. A pipe had a small crack which caused a small drip. Even a small amount of water does a great deal of damage over time. 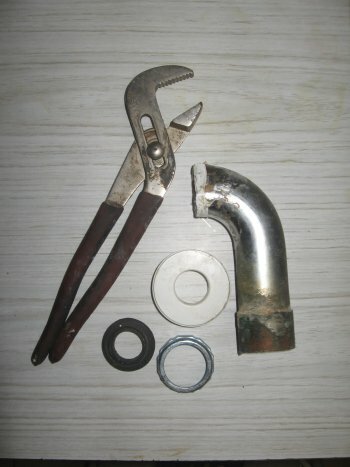 I took apart the P-trap to discover that the pipe which had the crack was welded into another pipe. I cut it out, then I go to a big box home improvement center to buy the parts that I needed. Problem: they did not have everything I wanted to make the repair in the right way. I did what many people do; I bought what they had to make the fix. Being a home inspector, I was thinking to myself: if I am selling this house, will another inspector point out this job? I am not planning to sell, but this thought has occurred to me recently, because I have been considering what homeowners who are selling are facing. I ended up constructing the parts that I needed from what was available with the help of some marine epoxy. I could have gone to a specialty plumbing supply store, which would have been the best option, but it was out of the way. When I looked around me in this warehouse of a store, I saw a man standing in front of some fittings asking a passing employee for help. The employee only had a vague knowledge that the part he needed must be in this section. I came to his assistance, and we found the part. It struck me that the average homeowner is best served by a smaller hardware store. Much of the time, I find the precise part that I need there, and the staff frequently has a better understanding of how to do the repair, so they can offer good advice. That is my first tip: if you are not sure of the best way to fix your project, avoid the big box home improvement center. If you have a clear idea of what needs to be done, then this big boxes can be great, but I would not expect to obtain all the help that you may need in one. Practice makes perfect in home maintenance. If you are an occasional do it yourselfer in repairing your home, the best tip that I can give you is to plan extensively before you begin any project. Going back to my plumbing project, replacing a pipe under the sink is really quite easy. However, I faced the problem that the part that I wanted was not available to me. Things go awry, and a project which should have lasted a half hour ended up lasting several hours. The job was expanded by a further problem caused by me. The food waste disposer has a gasket between the mounting flange and the basin. When I moved the disposer to fit my new pipes, I broke this gasket, so I had a new leak. I had gasket material on hand, so I made a new one. Trying to fix one item can lead to problems with another, so it is best to be prepared. I try to visualize what I need to do, and what may go wrong, so the job does not get away from me. My second tip is to take a breather to think about what you will need and what you will have to do for your project. Even experienced people need help would be my third tip. Right now I am working in my attic. I have little space up there, so I stay in a crawl or seated position for my adventures in that realm. I am installing a radiant barrier, and to be honest, the whole process would be so much better if I had help. My son does not realize it yet, but he will be recruited during the holidays for another project that I have in mind up there. Sometimes we just need someone to look over our shoulder for a little advice, and sometimes we need a little knowledge. For the knowledge part, I think that there are several home maintenance books that suffice, and it is good to consult those before a project. Your project may entail something that you had not considered. Thoroughly check out your work. Getting back to that house which I inspected last week, there was item that could have been a simple wiring mistake, or it could have been something more serious. A popular project for a homeowner to obtain some energy efficiency is to update their thermostat to a programmable one. This is a do-able task for most people, but you do have to make sure that you followed the steps correctly. I had difficulty with the jumper wires that were needed to make the thermostat work. These wires are about a half inch long, and they are used by the control system of the thermostat to send messages to your unit. You have to determine the set up by looking at your old thermostat, and then set the wires to the correct positions in the new one. In the case of this home, the heater never would engage. When you set the thermostat to heat, the air conditioning began. The heat did not start in any setting. My guess was that whoever installed this nice thermostat failed to look at the wiring of the old unit. Since it was installed when the weather was nice, I can imagine that either all of the settings were not tested, or if they were, the installer decided it would not be noticed. The problem now is that the old thermostat is no longer there. A service technician will now have to figure out the proper way to wire the unit. Study up on how to do a job. In this house, there were many small mistakes evident in the repairs. Before becoming a home inspector, I think that I could very well have made many of these mistakes. We gain a bit of knowledge about how to make a repair, but we really do not understand how the system is meant to function. For example, the weepholes in a brick wall on this home were sealed. These holes let moisture from behind the wall escape, so that moisture will not damage the framing. Most of us know that pests use these holes to enter the home, so we want to block them, thus causing another problem. You could place a wire mesh in these holes. This prevents pests from entering (at least most types of pests), while allowing the moisture to escape. There are a few internet sites that can help you learn, but I think the best solution is to have a home repair manual, like the one from Reader’s Digest or Home Depot. I one time produced a home inspection report which had every item listed as in need of repair. Many items were small issues like the weepholes. I realize that sellers may find this to be nitpicking. The biggest bone of contention is mentioning that a home built fifty years ago is not built to current standards. Next year, I will have to mark service panels (breaker boxes) as deficient if they do not have an AFCI breaker in place for the bedroom areas, because it will be required by the state of Texas. The reason is that it is a safety issue, but I can hear a seller now saying that it has been safe all of this time, so why do I need to put it down. Here is the heart of the matter: a home inspection report focuses on safety issues as well as problems with the home, but it does not require sellers to make any of these repairs. Looking at a home inspection report can be daunting, but a seller needs to discuss with the buyer what is important to them. Those are my tips. Do you have anything to add? This entry was posted on Tuesday, December 16th, 2008 at 3:14 pm	and is filed under Living in your Home. You can follow any responses to this entry through the RSS 2.0 feed.